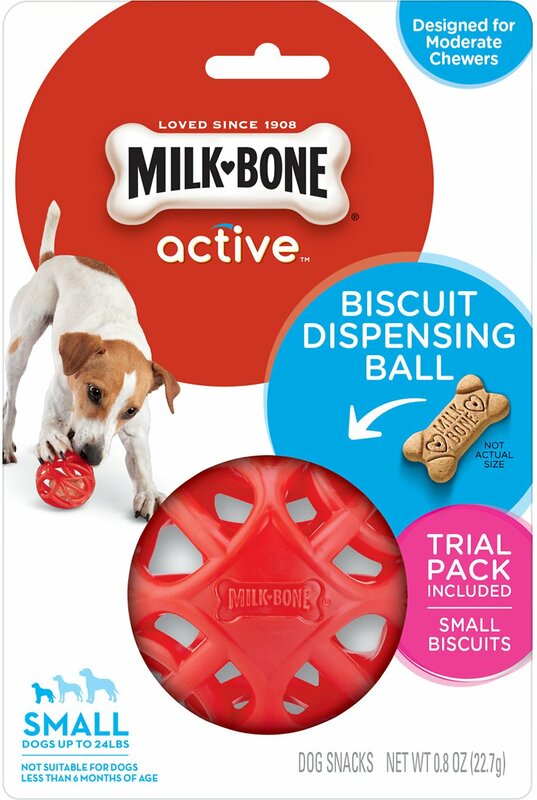 Treat your best friend to hours of engaging entertainment with the Milk-Bone Active Biscuit Dispensing Ball Interactive Dog Toy. Stimulate and reward her healthy, positive behavior with this durable, interactive toy that delivers delicious dog biscuits in a fun and challenging way. 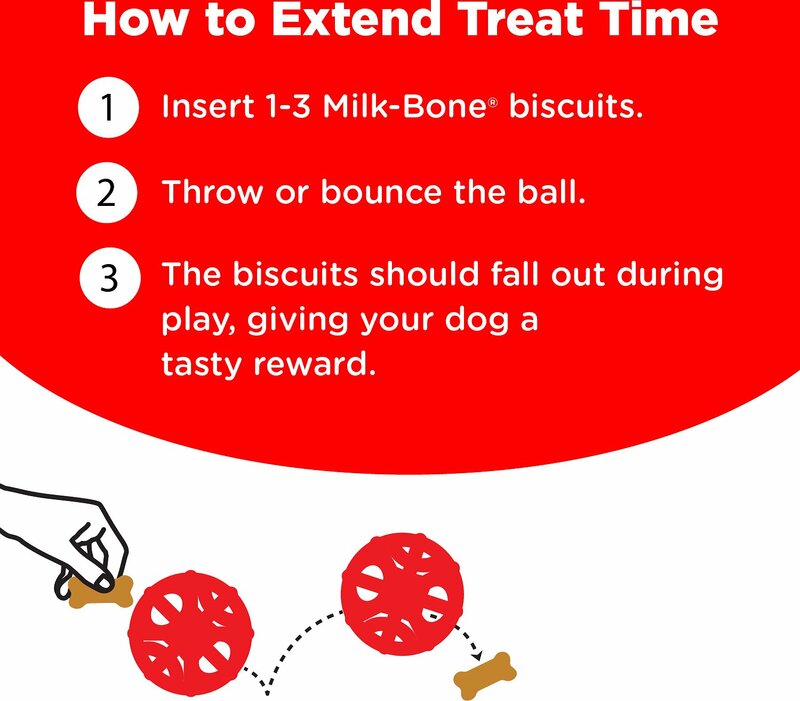 Just insert a few Milk-Bone Small biscuits, or similar-sized treats, and watch her roll and nudge the toy to get to her tasty treasure. 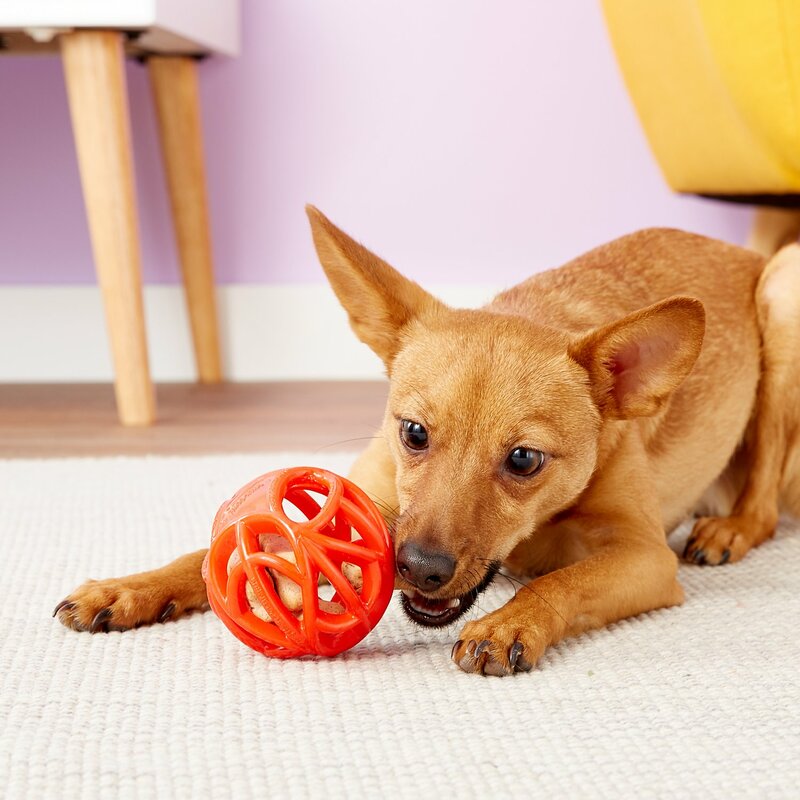 Specially designed and researched by dog experts, this toy treat dispenser releases wholesome treats as it bounces and rolls in exciting and unpredictable ways, keeping your canine companion occupied and on the go. Treat your best friend to hours of engaging entertainment with this fun and challenging interactive toy. Stimulate and reward her healthy, positive behavior with this durable toy made from high-quality, non-toxic material. 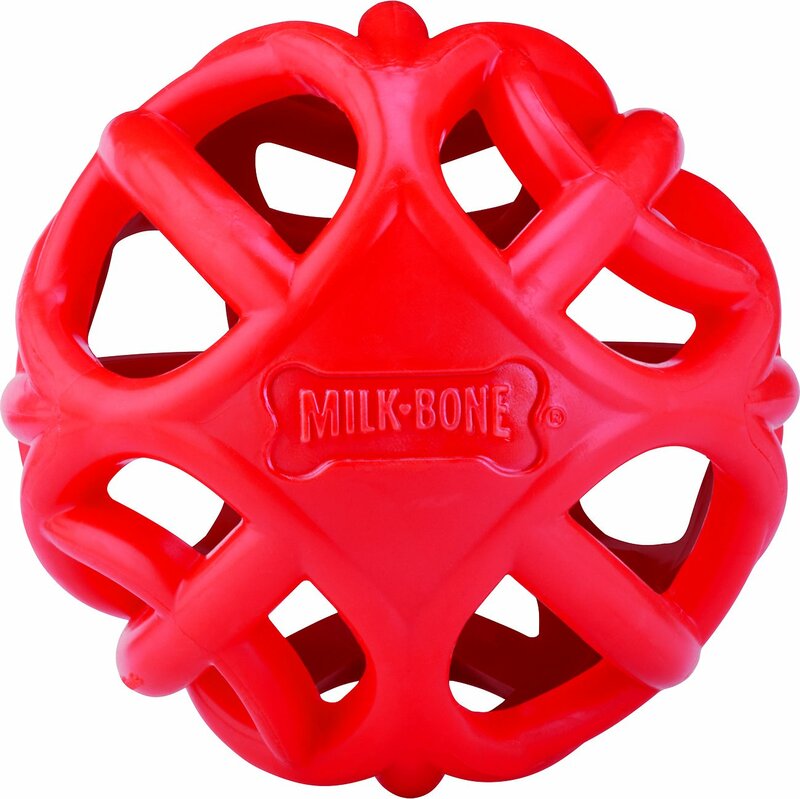 Designed to dispense Milk-Bone Small dog biscuits, or similar-sized treats, as she rolls and nudges the toy. 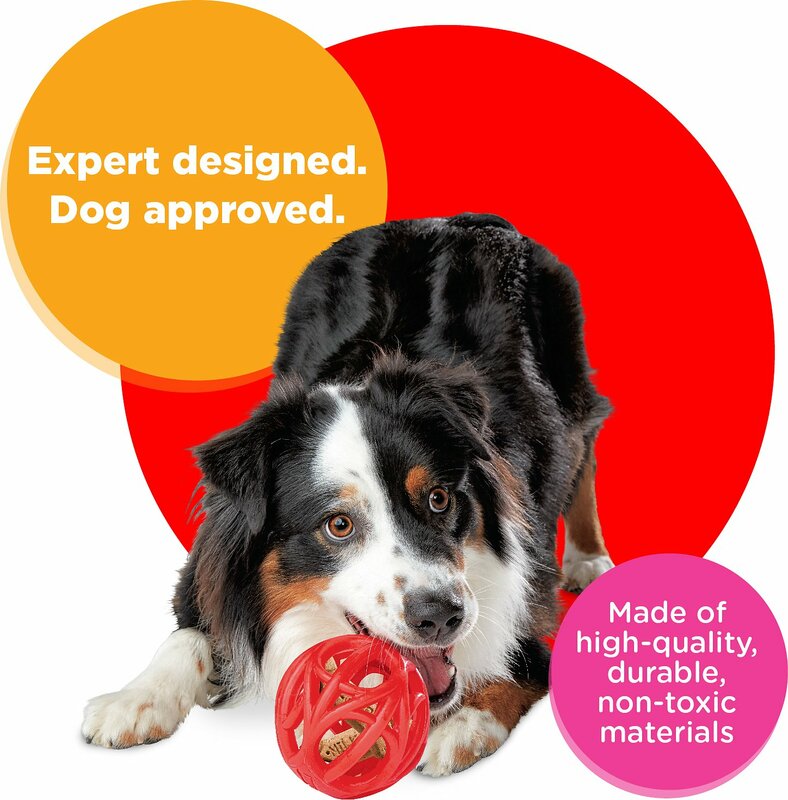 Made in the USA and available in two sizes–small is 3 inches in diameter and recommended for dogs up to 24 pounds; medium is 4 inches in diameter and recommended for dogs up to 49 pounds. 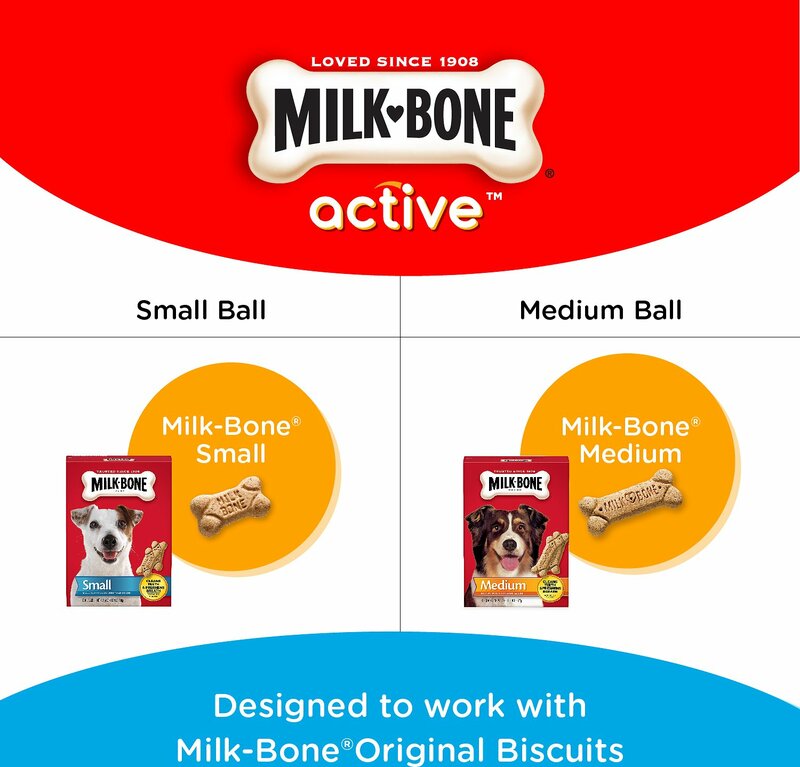 Includes a trial-sized pack of Milk Bones Biscuits. My dog is not a super chewer, but very busy dog. This ball is made of a rubbery plastic that gave her a run for her money and is easy to clean. But today she sadly destroyed it. I am ordering another one (even knowing the same may happen) because it was great interaction for her, she did like it and it did last longer than others. I did recommend to a friend and she bought 3 and her younger dog was entertained for 1.5 hrs, and has not destroyed any of them. Keeps our dog occupied the longest of all her interactive toys! Of all her interactive toys, this one easily keeps her occupied the longest. Since she can see the treat in the ball, it keeps her motivated. Eventually she will run it up into a corner and just move it ever so slightly till the Milkbones slip out. Highly recommend for the price, the quality, and the fun! Had the puppy Kong that looks like a bone and was still using it 3 years later but realized he was getting the treat out w/o any effort where may as well have given the treat directly. Wanted something small that kept him busy and was good for 1 or two hard/milkbone treats and this works perfectly. Not too difficult for him to get bored and leave it but lasted longer than 30 seconds before he was eating his treat. He also will use it for fetch w/o treats so extra bonus of fun! Got the smaller option which is about 3" in diameter/size of a tennis ball. Very well made toy which keeps dogs interest. Adding treats is very simple process. Easy to clean . Dog enjoys the challenge of getting treats out. My mom laughs when I try to get the treat. My mom used to give me a treat by hand, after I go out to do my business. A nice Chewy representative recommended this, and my mom is happy she ordered it. Myself, I really just want the treat! My Alaskan malamute loves this toy! Keeps him occupied for hours. He loves chewing on it and chasing it and it keeps him from chewing on the furniture and other things. This came with sample treats- but I found larger ones work better with my boys. This is DURABLE & easy to use. Good size (doesn’t automatically disappear under furniture) One of the bettee toys! We bought the Dispensing ball toy to keeps our dogs curious and entertained. It has done a great job doing just that. This is a heavy duty toy that is fairly hard to get the big king treats out of. It also rolls a little wonky and he loves that!